The Discovery heavy duty four wheel rolling walker offers the ultimate in style and features at an excellent price! 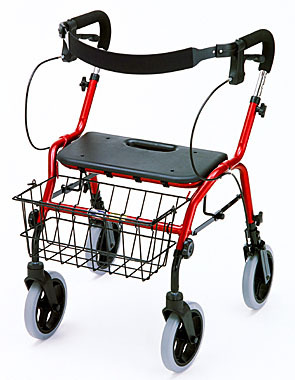 The Discovery offers a unique height adjustable frame, as well as handles, making it the walker of choice designed to fit most any user. The extra wide 18" seat and heavy duty 300 lb. capacity gives added comfort. Yet this walker folds down and is easy to transport in the smallest of spaces. The Discovery comes standard with backrest, seat and basket. The locking hand brakes give added safety when seated. Adjustable Height Handles and Frame. Seat, backrest and basket are standard. Seat Height to Ground 20", 21" or 22"
Adjustable Height 31" to 35"